If you've played the previous Spyro games you'll know what gems are for. For collecting and for paying Moneybags off with. Each level has a finite number of gems within all laid out in certain places. You'll find them lying on the ground, inside baskets, inside vases, and inside Riptocs. Red Gems are worth 1. Green Gems are worth 2. Purple Gems are worth 5. Yellow Gems are worth either 10 or 25 depending on how they're feeling. Oddly the creators of the game forgot to differentiate between 10 and 25 and instead used the same Yellow Gem for both. Later on in the game, after defeating Ripto for the first time, you will gain the Gem Finder ability which when you press L3 + R3 (PS2) or L + R + D-Pad Up (GCN) Sparx will turn towards the direction of the nearest gem. Handy for finding those last missing bits of treasure. At full health Sparx is Yellow. Take one hit and he'll turn Blue. Another and he'll become Green. One more and he'll disappear altogether. And one final hit and you die, losing a life and returning to the last place you were zapped by Zoe, or failing that the last place you entered the level. To regain Sparx's colour you need to feed him butterflies. You can find these all over the place, simply kill the small Fodder animals and a butterfly should pop out all ready for eating. Each level has a different creature for Fodder but you should easily spot them as they're the smallest creatures in the game. One of a very short list of new features that the game has is that of multiple breaths. 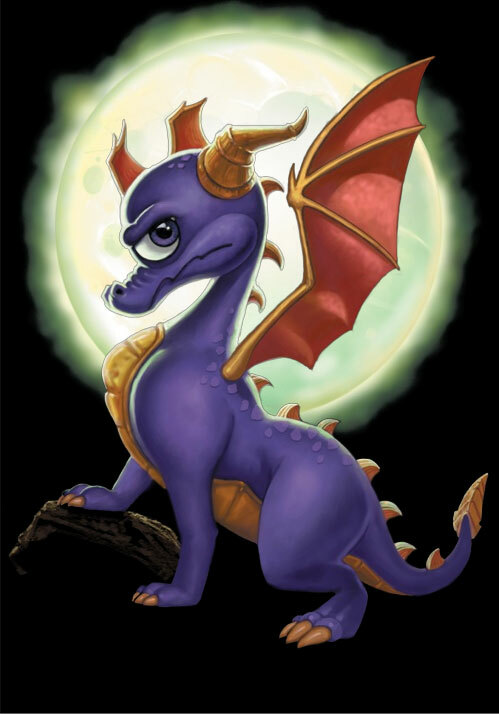 At the start of the game Bianca casts a spell that allows Spyro to gain extra breaths by bringing a Magic Rune to the Spirit Dragon in Dragon Realms. There are only three runes to do with breaths, the fourth is for Wing Shield. Fire Breath you'll have from the very start. This is useful in defeating enemies of all shapes and sizes as long as they don't have armour. Bubble Breath you'll gain almost straight away, the rune is directly ahead from where you first begin the game. It is used solely for capturing the missing dragonflies. Remember to switch to a useful breath afterwards, breathing bubbles at that Ninja won't do you much good. The rune for Electric Breath / Lightning Breath (the game doesn't seem to be able to decide which) is found in the Dragonfly Dojo. This is used in much the same instances as Fire Breath, it can also be used to power machinery and kill some specific enemies. Ice Breath is the last one that you find, the rune for it is in Cloud 9. Ice Breath freezes enemies on the spot allowing you to smash them into tiny pieces by charging at them. It is also useful for specific enemies. The game will autosave when you go into a loading screen of any kind. You can also manually save from within the Options menu. Zoe's zap doesn't constitute an actual save but it brings you back to that location if you happen die so that you don't have to go back to the start of the level again. Anyway, on with the walkthrough and into Dragon Realms. Ripto is back in this game. r u the same yearofthe from YouTube? Press the analog sticks, the left one for L3 and the right one for R3. what the HECK is L3 and R3? I don't really know what you should add. I think you've worked hard enough on this website let alone being bothered by other people over some suckish game! Uh huh. And what would you suggest I add? There are 3 Speedway in 3 world it's a little tough so keep trying. Thank you! I'll be coming back for more! It's still a work in current progress, yes. I'm aiming for daily updates until it's done. I'm not sure how recently you've worked on this page. Are you going to finish? I would greatly appreciate it!